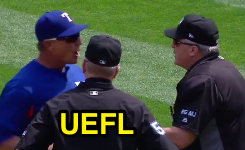 HP Umpire Bill Welke ejected Rangers Manager Jeff Banister (foul ball call) in the bottom of the 3rd inning of the Rangers-Athletics game. With none out and none on, A's batter Khris Davis hit a 2-2 changeup from Rangers pitcher Martin Perez on the ground to third baseman Joey Gallo, ruled fair by 3B Umpire Mike Everitt, as Gallo threw to first baseman Mike Napoli prior to Davis' arrival for an apparent first out; however, as Napoli received Gallo's throw, Welke motioned for "Time," so as to call the ball foul. Replays indicate the batted ball appeared to traverse the left field foul line at the front edge of third base and did not appear to contact Davis while he was in the batter's box, the call was incorrect. * At the time of the ejection, the Athletics were leading, 4-0. The A's ultimately won the contest, 9-1. This is Bill Welke (3)'s first ejection of the 2017 MLB regular season. Bill Welke now has -2 points in the UEFL Standings (0 Previous + 2 MLB - 4 Incorrect Call = -2). Crew Chief Mike Everitt now has 1 point in Crew Division (1 Previous + 0 Incorrect Call = 1). *Although the fair/foul call beyond the front edge of first/third base is ordinarily reserved for the base umpire, U3 Everitt clearly called the ball fair while plate umpire Welke clearly called it foul. Thus, in regards to ejector classification (UEFL Rule 6-2-c-1) this is deemed an "incorrectly ruled call by the ejector," as in UEFL Rule 4-2-b-3. Due to Welke's foul ball call, Everitt is deemed secondary while Welke is deemed the calling umpire (as Welke's foul ball call prevailed). This is the seventh ejection report of 2017. This is the 5th Manager ejection of 2017. This is Texas' 1st ejection of 2017, T-1st in the AL West (SEA, TEX 1; HOU, LAA, OAK 0). This is Jeff Banister's first ejection since September 19, 2016 (Joe West; QOC = Y [Replay Review]). This is Bill Welke's first ejection since August 15, 2016 (Don Mattingly; QOC = U-C [Check Swing]). Wrap: Texas Rangers vs. Oakland Athletics, 4/19/17 | Video via "Read More"